Run as a separate operation, Volcanic Slopes Vineyards is a second label of sorts of Argyros Estate. It is the brainchild of Argyros’ winemaker and commercial director, Stefanos Georgas. The idea is to make as pure an expression of Santorini Assyrtiko as possible using a hands-off approach. This 2013 is the first vintage of what is, so far, its only cuvée. Assyrtiko (100%) from 80- to 150-year-old ungrafted vines in two parcels: one with pumice soil in Episkopi Gonias, the other with basalt soil in Megalochori. Manually harvested. Half of the must is free-run juice, the other half is juice from gently pressed whole clusters. Fermented with indigenous yeasts. Matured 14 months on the lees with frequent stirring in a naturally temperature-controlled underground concrete tank in the old Argyros winery. 13.5% ABV. Quebec agent: oneopole. The estate’s entry-level bottling. 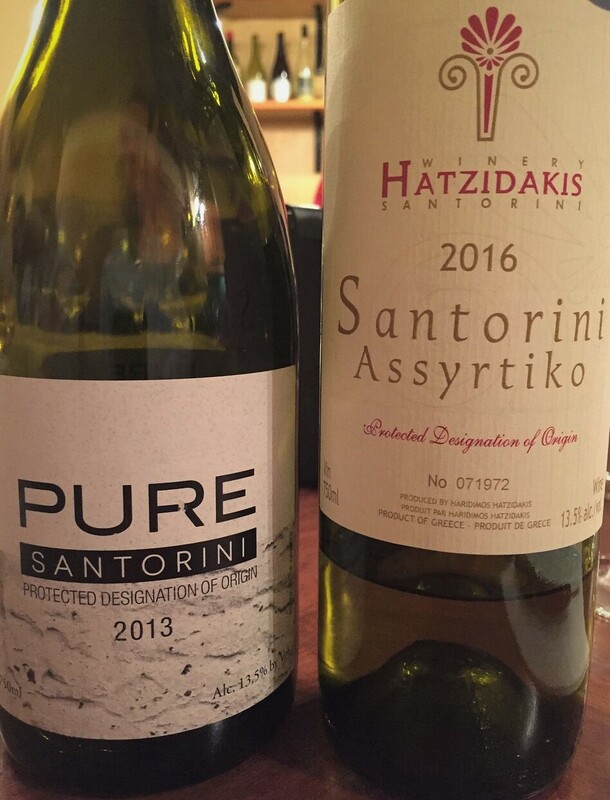 Sadly, 2016 was Haridimos Hatzidakis’s last vintage. 100% Assyrtiko from organically farmed, ungrafted vines up to a century old in Pyrgos, Megalochori, Akrotiri and Vourvoulos. The manually harvested grapes were direct-pressed. The must was clarified by settling, then fermented with indigenous yeasts in temperature-controlled (18°C) tanks. Stayed on the lees for 40 days. Matured in stainless steel tanks. Lightly filtered and dosed with sulphur dioxide before bottling. Reducing sugar: 1.9 g/l. 13.5% ABV. Quebec agent: oneopole.